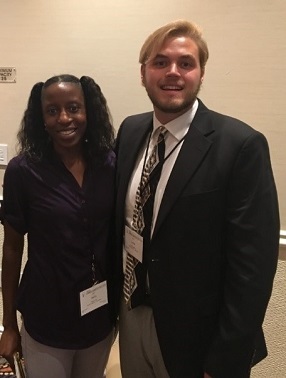 Two South University Doctor of Pharmacy students recently attended The American Pharmacist Association Academy of Student Pharmacist’s (APhA-ASP) Annual Leadership Conference in Washington, D.C.
South University, Savannah student Nelly Ayen and South University, Columbia student Zane Singletary both serve as APhA-ASP chapter presidents at their campus, and attended the event with more than 200 other pharmacy student leaders from around the U.S. The leadership institute included sessions on team building, connecting with communities, and balancing the demands of the profession. In addition to the Leadership Sessions, students attended a reception at the US Capitol and had the opportunity to advocate in support of a bill that would expand Medicare coverage for certain services provided by a pharmacist.